Office life is no longer the real-life Office Space and especially not for startups. Startup businesses tend to have the most inspiring, creative and bright people around working within them so it only makes sense that their offices would be just as fun and engaging as their products are. In this post we will look at how creative some of the worlds most popular startups have been with their office space Including Google, Spotify, Airbnb and Etsy. You could think you work in the best office in the world but unless you are working in the real-life Fortress of Solitude, you’re entirely wrong. Pionen is a server housing centre that can withstand a hydrogen bomb. If the power goes out, back-up is provided by German submarine engines. 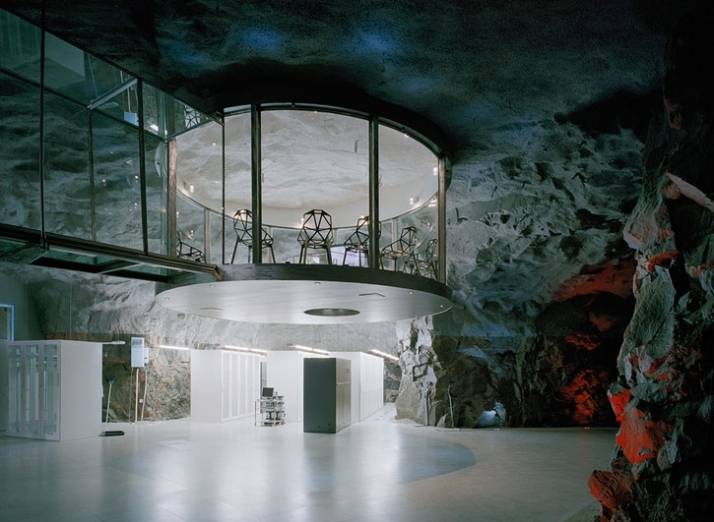 The site is 100 feet underground which just adds to the awesome that is this amazing office! The offices have indoor jungle plants, low lying fog, false waterfalls and a conference room with an image of the moon’s surface on the floor. Basically, this is heaven for any computer nerds and also serves as a metaphor for how safe Pionen is. A safe haven for hipsters, students and anti-mass-production folks, Etsy is the online home of all things handmade and crafty. Admittedly, if you don’t like Etsy much, you won’t like their offices much but if you ARE a fan of Etsy then their New York office will look a little bit like your dream workplace. Cosy, quirky and entirely unique… The New York Etsy office is the closest you’ll get to a physical version of Etsy itself. Couchsurfing.com is a traveller’s best friend. It connects travellers all around the world with people willing to spare some space. The whole concept is oh-so-modern and on trend so it’s no surprise that the San Francisco Couchsurfing office is a laid back, fun atmosphere. Swings, beanbags and open-plan interiors… what more could you want? Founded in 2008, Airbnb offers travellers an alternative to hotels and B&B’s providing a more unique travel experience with anything from bedrooms to boats, to castles to full city centre apartments, Airbnb have gone from strength to strength in their short 6 years and now have offices around the world. 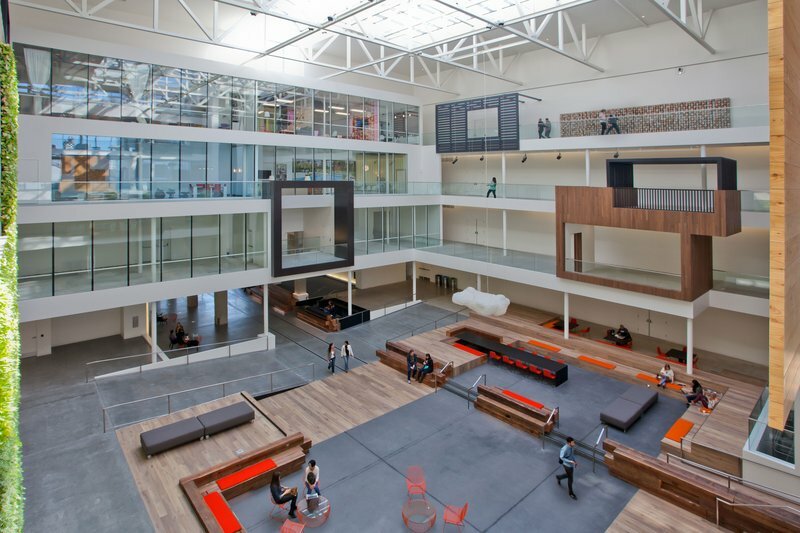 Airbnb base their San Francisco office designs on actual listings on the website. The room pictured is actually based on a room listed in Soho, New York! This one possibly speaks for itself! Google has notoriously fantastic offices but the Dublin office is particularly awesome and inspiring. Game of pool anyone? Migo are a media infrastructure company whose offices have been built to be as comfortable and laid back as their work is. The office is open-plan, welcoming and the very few cubicles they have are shaped like barns. Yes, you read that right. Skyscanner is an online comparison and booking agent offering comparisons on flights, car hire and hotels. The Skyscanner HQ office is complete with country-themed board rooms, aeroplane seating and bright colours everywhere you look; Skyscanner’s office perfectly suits the brand and is a showcase of how far they’ve come in 10 short years. Quirky are a company that take your ideas and, after discussions, debates and a group decision, they decide whether to take on your idea. If they decide your idea is great, they make your dream a reality. Quirky’s NYC offices have exposed bricks, exposed pipes and an ultra-hip 50’s throwback diner. Basically everything you’d expect from an NYC office and more. As if you didn’t know… Launched in 2008, Spotify is an online streaming service offering free, unlimited or premium memberships. Spotify’s enormous NYC offices unsurprisingly encourage creativity, fun and relaxation. Designed by the Spotify in-house design team, the offices are colourful, modern and filled with natural light. Spotify’s offices are ideal for both inspiration and focusing. AOL Ventures is the venture capital arm of AOL which focuses largely on early stage investment and growth of small businesses. AOL Ventures’ office is a space that is let-out to companies AOL has invested in. Their offices are also open-plan but also have areas that companies can escape to for privacy. Very cool article. I’ve been to the Skyscanner HQ once, it’s truly impressive. Google’s Dublin offices look so nice, I want a game of pool now! Hi Louis, I’ve never been myself but from what I have seen and heard they are very nice I think every office Google has across the world is super cool I have yet to see one…. I really love the data center, its like something from a James Bond movie!